Day of the Shirt collects daily and weekly t-shirt sales from across the Internet and aggregates them all in one place. We dug into our activity stats to find the most popular pop culture t-shirts of this year. No click bait or listicles. Just shirts. Here they are. 10. Overnight Party by Once Upon a Tee: huddled around their gaming setup and snacks, the women of Overwatch have a slumber party. 9. In Memoriam by Graja at Threadless: a spoiler for Game of Thrones, though by now we expect everyone to die. George R. R. Martin himself said he’d directed 2016. 8. Pokehouse by Naolito at Pop-Up Tee: this Pokémon Go + Peanuts mashup evokes the feeling of capturing Zubats and Squirtles all day. 7. Computer Repair Patch by WeirdNeighbor at Tee11: a classic tee with the emblem from the USA Network show Mr. Robot. 6. Feminist Agenda T-Shirt by Karen Hallion at TeePublic: the past, present, and future is female. We’d like to take a moment here to remember Carrie Fischer, portrayed on the shirt as Princess Leia. 5. Delete your account by 6 Dollar Shirts: no sentence captures 2016 more. 4. Villains Shadows by Jalopdesign at Pop-Up Tee: Batman villain t-shirts are more popular than Batman. 3. Team Mystic by Once Upon a Tee: this was one of the first Pokémon Go designs we saw, and this design continues to beat out Valor and Instinct in popularity. 2. Founding Chargers by Tom Galla at Blipshift: we were surprised to find this Benjamin Franklin + car intake and exhaust cycle mashup to be so popular. 1. 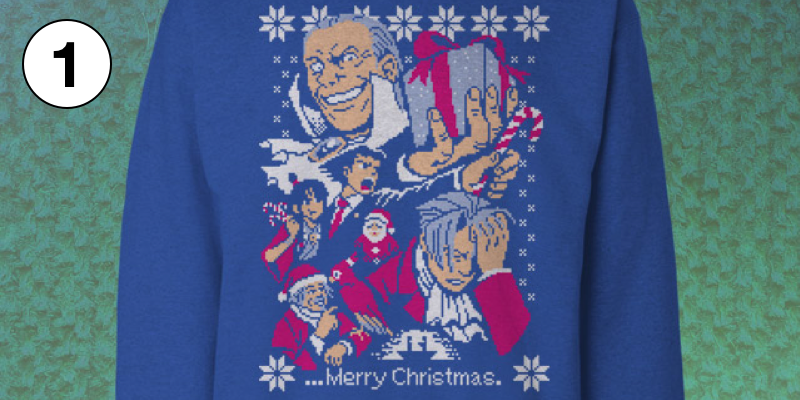 Turnabout Christmas by Nina Matsumoto at The Yetee: bookending our list with another video game theme, this Phoenix Wright: Ace Attorney holiday sweatshirt is the most popular design of 2016. T-shirt packs and collections are becoming more and more popular, so this year we decided to separate them from the single designs featured above. By far we found the most popular collection to be TeeFury’s Strong Females Collection. 2016 Dumpster Fire by 6 Dollar Shirts didn’t win 2016 based on our stats, but this design sure captured the experience for us. That’s why it’s displayed at top of this post. Have a New Year’s Resolution to find the best t-shirts before your friends do? Customize which sales you see, get access to special coupons, and track your favorite shirts all by creating an account on Day of the Shirt.